RAM and Android; Android and RAM. Sooner or later this will come up. So, let's get the discussion under way. Memphis turns his device on from a powered down state, Android loads everything up, and is ready to go. He then opens App #1 for the day. After using it for a few moments, he opens App #2, uses it, and then goes to the homescreen and goes about his day. A little later, he opens up App #1 again, and it loads a bit faster. Android manages the apps stored in memory automatically: when memory is low, the system will begin killing apps and processes that have been inactive for a while, in reverse order since they were last used (oldest first). This process is designed to be invisible to the user, such that users do not need to manage memory or the killing of apps themselves.However, confusion over Android memory management has resulted in third-party task killers becoming popular on Google Play store; these third-party task killers are generally regarded as doing more harm than good. Here is the why: The device Memphis was using had App #1 loaded in RAM. Android did not have to spend the extra time (which can be equated to battery power) loading the app from the internal storage and launching. Now, not everyone uses just one app, we open several. The OS needs to have certain things loaded to help apps and related files and operations executable (think images, and radios). This done multiple times, eventually will bring RAM to nearly full. RAM is nearly full and Memphis really needs to open up App #3. Android will look at the recent apps and sees that App #2 that Memphis opened at the beginning of the day, and hasn't been used since, can be killed to make room for App #3 to launch. App #3 then launches without a problem. The big deal is here is where users start to diverge into two main groups: Those who use task killers and those who do not. The classic rule of thumb for Android. To add to it, misspent RAM is almost as bad. Take for example, when I got my S3 from Sprint. One of the widgets was from the Associated Press. Always kept up on RAM usage, even though I never opened it. In fact, I didn't know I had it until I had the device for a month. All that time, AP was sucking up RAM (albeit a fairly small amount) that could have been used elsewhere. May not seem like much of a problem, but take a device that is very inexpensive, and that extra RAM sucked up is a bad thing. Also, add all the other garbage that is bloat that not many people use, and the misspent RAM adds up, and quickly, even on a high end device. Android has greatly changed since the days of old. Most people would agree that Gingerbread on most devices was, at best, horrible at RAM management. Back then, automated task killers were almost a necessity. But for the most part, Android can do it quite well on it's own. Task killers can be as hard on the battery as they would do good. Many kill almost any running task, which Android then restarts because it needs it, spends battery firing up the CPU, bringing it out of memory and loading it. The Task killer then sees it again, and kills it. This brings about an endless cycle, thus draining the battery more than it should be drained. It has a Service that is currently executing code in one of its callbacks (Service.onCreate(),Service.onStart(), or Service.onDestroy()). 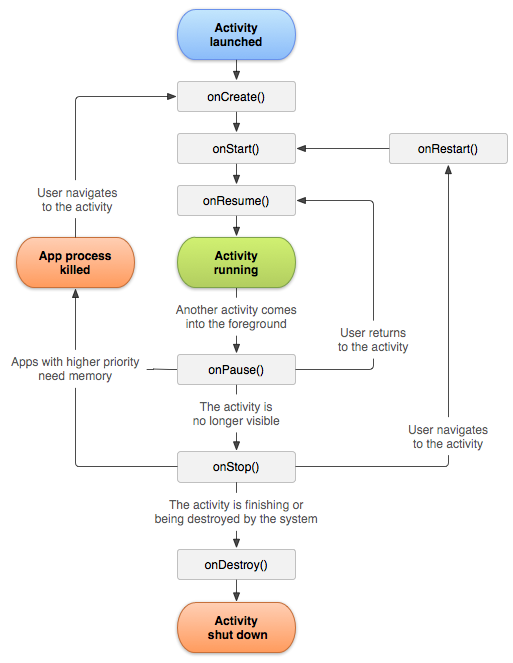 A visible process is one holding an Activity that is visible to the user on-screen but not in the foreground (its onPause() method has been called). This may occur, for example, if the foreground Activity is displayed as a dialog that allows the previous Activity to be seen behind it. Such a process is considered extremely important and will not be killed unless doing so is required to keep all foreground processes running. A service process is one holding a Service that has been started with the startService() method. Though these processes are not directly visible to the user, they are generally doing things that the user cares about (such as background mp3 playback or background network data upload or download), so the system will always keep such processes running unless there is not enough memory to retain all foreground and visible process. A background process is one holding an Activity that is not currently visible to the user (its onStop()method has been called). These processes have no direct impact on the user experience. Provided they implement their Activity life-cycle correctly (see Activity for more details), the system can kill such processes at any time to reclaim memory for one of the three previous processes types. Usually there are many of these processes running, so they are kept in an LRU list to ensure the process that was most recently seen by the user is the last to be killed when running low on memory. An empty process is one that doesn't hold any active application components. The only reason to keep such a process around is as a cache to improve startup time the next time a component of its application needs to run. As such, the system will often kill these processes in order to balance overall system resources between these empty cached processes and the underlying kernel caches. The down side to task killers is they are often non discriminatory in what should and should not be killed. Let's say for example, John Doe uses Task Killer Extraordinaire and uses it to kill Nova Launcher (I checked this against a common task killer, this is possible). This will cause errors to come up, and he may not know why. Something that has to be kept in mind is most users who have an Android will probably equate it to a Windows PC. In the subject of RAM, Android is not Windows. Windows likes to have RAM somewhat empty on standby. That is the way Windows OS works; more RAM is typically better to an extent (there is a critical mass idea of after a certain point, the extra RAM becomes irrelevant). Android, conversely, likes filling it, so it can use the cached data to reload the application easier. belodion, Patrick Schroedl, Laura Knotek and 14 others like this. Laura Knotek, anon8380037, esteem viejo and 1 others like this. Thank you so much for putting this together. I seriously wish that people were required to read this and recite it back in order to download a task killer, battery saver, blah blah, you get the idea Let the OS do it's job! This part: This process is designed to be invisible to the user, such that users do not need to manage memory or the killing of apps themselves. However, confusion over Android memory management has resulted in third-party task killers becoming popular on Google Play store; these third-party task killers are generally regarded as doing more harm than good. I'd like this part to be bold, multi-colored, underlined and font size 500,000,000. I want every android user from now until the end of time to be able to see that section from space. Golfdriver97, B. Diddy, UJ95x and 2 others like this. Golfdriver97 and Aquila like this. Wow, this really helped me to understand. Thank you SO much! anon8380037, Golfdriver97, Enverdaz and 1 others like this. Does this mean it would be better never to close all tabs? Or is that an entirely different thing? Welcome to the forums. If you mean the tabs in the recent apps menu, yes. Sometimes, when my device is getting loopy, I will close all apps, but more often than not, I will reboot the whole device. Dan Davis3 and Laura Knotek like this. Good question. From its description, it flirts with some things that a task killer does, but it looks more like its user directed, as opposed to the app itself directing what gets killed and what doesn't. I think I will install it myself to see what it's like. Hello everyone . Like to root phone and make it run faster samsung galaxy s7 . New to all this any tips in right direction would be awsome. This is why I always laugh when I see someone say we need 6gb of RAM. VLC for Android, How to play videos on external SD card?